I decided to read this in preparation for the new movie coming out soon with Chris Pratt in it called Jurassic World. Before reading it I knew Jurassic Park was a book with dinosaurs as a central focus, but nothing else. For some reason I had a vague suspicion that a time machine was involved, probably because of the T-Rex ride at Disney World in Orlando, FL that I’ve been on a million times. Clearly, I stand corrected. One of my favorite things about this book is that it incorporates numerous mathematical and scientific theories into the story. For example, Ian Malcolm (the mathematician in the story) uses chaos theory to explain how the park would eventually crumble to ruin. There is also a ton of information about genetics, cloning, and the bioengineering industry in general. Not to mention dinosaurs! After reading some reviews of this book I learned that apparently a lot of the information in this book is wrong, but did people actually think otherwise?!?! 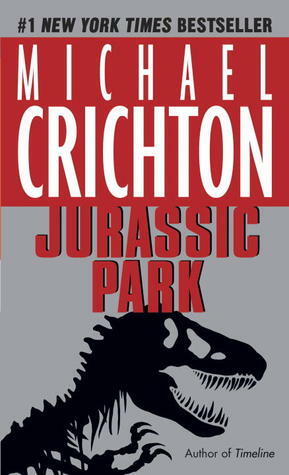 If everything was correct and physically plausible, then Michael Crichton would have just built Jurassic Park himself! Crichton writes this in a way that is frighteningly believable, which makes it even more fascinating to read. I’ll be honest: this book is SCARY. The scariest part for me is the intelligence of the velociraptors, especially towards the end. They know how to play tricks on humans and trap them so they can launch their attacks. You never know when they’re lurking in the shadows, waiting… I still get shivers just thinking about it! The fear factor makes this book extremely suspenseful, and all I wanted to do was sit in a cozy chair for hours and read it. It is scary without being overly gory, graphic, or disturbing, which is always appreciated. I haven’t read many really scary books before (mostly because I generally don’t enjoy them) but this one is excellent! I also really like the way this novel raises important questions regarding the way we approach science as a modern society. One of the characters (I think Ian Malcolm) points out that scientific advancements cannot educate us on the best way to use them or tell us when to stop using them. Science without morality is an incredibly dangerous concept, yet this is the direction we may be headed in if we don’t take a step back and look at the bigger picture. In the story, Jurassic Park is built without any consideration for what effect it might have on the culture of the scientific world. Such an occurrence would cause other companies to try to replicate it. This would ultimately lead to a complete disregard for our history, because why study it if we could simply recreate it? Moreover, it would create even more gray areas in the field of genetics because yet another line would have been crossed. Of course, I don’t think we’ll be breeding dinosaurs anytime soon, but there are certainly ways that we could get into trouble like this (to a lesser extent, hopefully) in the near future. The importance of morality in science needs to be stressed, as do questions concerning how far we should allow science to take us as a society. If we think about these ideas now, then we will be better prepared to address issues that may arise in the future. Overall, this novel is FANTASTIC. Not only is it incredibly exciting, but it is also very thought-provoking. You can read it solely for its entertainment value, or you can choose to explore its deeper themes and questions. It’s a versatile story that has the power to captivate decades of readers, both young and old alike. I’m definitely looking forward to reading the sequel, and I cannot wait to watch the movies! I haven’t even seen the original movies, so I think I’ll start there. Have you ever read this book or seen the movies? (Either the new or old ones?) What did you think of them? Let me know in the comments section below! I want to read this someday. I enjoy the movies… I still need to see Jurassic World. I think I am going to read the sequel, since I loved the first one so much. But I definitely agree- it does make a great standalone! The ending is such a cliffhanger, but it doesn’t feel unnecessarily suspenseful. I love love love Jurassic Park and I don’t care that it’s scientifically inaccurate. I have a rather unhealthy obsession with dinosaurs to the point where I was excited to go to class at university when I had a whole semester about them. I I’m so glad you enjoyed it! You should definitely watch the movies, they are brilliant!